TIC Services Market size was estimated to be over USD 150 billion in 2017 and is anticipated to grow at a CAGR of more than 6% over the forecast timespan. The TIC services market is driven by the demand for the third-party service providers. According to the International Confederation of Inspection and Certification Organization (CEOC), approximately 40% of the market is currently being outsourced. Whereas, the remaining services are carried out in the in-house facilities. The privatization of the state-owned laboratories is the primary factor supporting the demand for third party service providers. Furthermore, the increasing pressure on the government organizations to reduce the cost is forcing them to restrict the market surveillance activities. This has also augmented the demand for the third-party service providers. Globalization is also one of the major factors driving the TIC services market. Over the past decade, the global trade has increased many folds due to the development of new trade agreements between the countries, especially in the BRICs. As a result, several firms are deploying and importing their products on the global scale. This gives rise to the requirement of the third-party accreditations and testing companies within the industry verticals to scrutinize the international supply chain. Therefore, TIC companies are constantly being called on to test, inspect, and certify their products and services. However, the lack of commonly accepted international standards is the major constraint to the growth of the market. Countries have developed their own standards to safeguard the consumers from the unsafe and non-compliant products and services. The companies had to comply with all these standards. This increases the cost of the operation and other expenses. 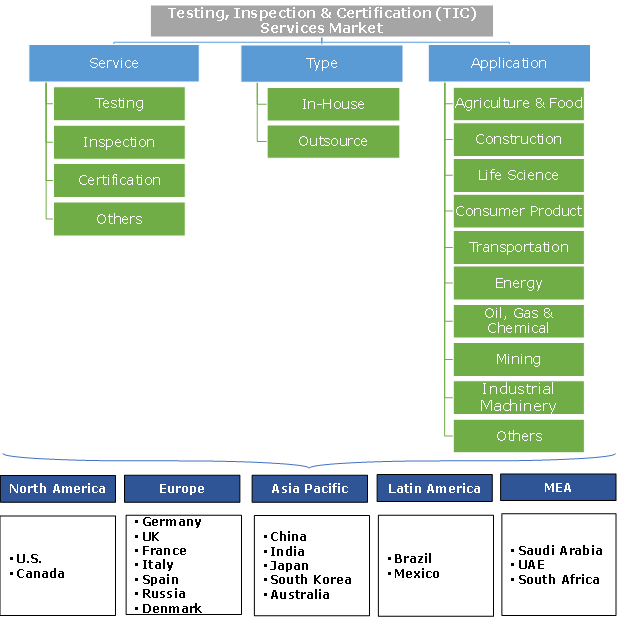 Moreover, the uncertainties in the macroeconomic environment and the complex nature of the international supply chain are also anticipated to be major constraints to the growth of the testing, inspection, and certification (TIC) services market. The testing services were leading the TIC services market with more than 65% of total revenue share in 2017. The testing activities mainly focus on measuring the properties and performance of the products and services. The growth of the market is attributed to the rising concern among consumer regarding the quality of the product. This rise in the conscious consumerism is encouraging companies to protect their reputation by maintaining the quality of the products and by adhering to government standards and regulations. Furthermore, the development of numerous government standards and regulations for the product safety and quality control also foster the market. The certification services are anticipated to grow substantially at the CAGR of over 9% over the forecast timespan. The growth of the market is driven by the constant efforts of the government across countries to restrict the development of high energy consumption products. 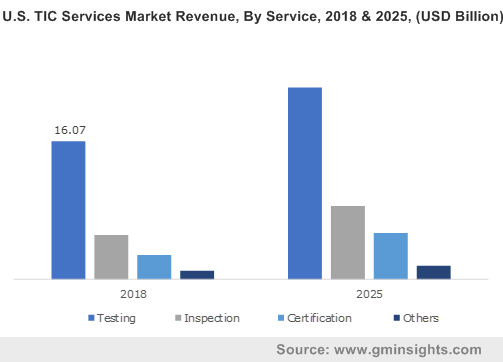 Furthermore, the rising requirement among the electronics product manufacturers to comply with the international standards is augmenting the demand for the third-party certification service providers. However, an end to the carbon certificate required by the Kyoto Protocol has affected the market growth. The in-house services held more than 60% of the total stake in the TIC services market in 2017. Earlier, manufacturers had to develop their in-house testing facilities to comply with the government standards and regulations. However, due to the increasing pressure to reduce the cost of operation and the need to focus on the core business competencies is encouraging enterprises to outsource the services. The outsourcing services market is anticipated to grow at the CAGR of over 8% during the forecast period. The development of numerous government standards and regulation to enhance the quality and efficiency of the products is driving the TIC services market growth. The transportation market is anticipated to account for over 25% of the total share in the TIC services market. The growth of the market is driven by the constant advancements in the vehicle components along with the development of the stringent government regulations and policies. The governments across the countries are constantly working on enhancing the safety, efficiency, quality, and compliance of the automotive components. Moreover, there is a huge demand from the aerospace sector. The construction market held over 15% share in the TIC services market in 2017. The growth of the market is attributed to the aging infrastructure in the developed regions. The construction companies are leveraging on the capabilities of the third-party services providers for testing and inspection of the construction material, machinery, and equipment. Furthermore, the rapidly growing industrialization and urbanization augment the demand for the TIC services in the construction sector. Europe is dominating the TIC services market with over 40% of the total stake in 2017. The growth is driven by the stringent government regulations and standards to maintain the quality of the product. The European government had introduced several regulations to enhance the product safety, environmental health, and life cycle of infrastructure. For instance, in 2018, the UK government had launched new regulations to reduce the carbon emission. The country’s Carbon Reduction Commitment (CRC) broaden existing emission trading structures to comprise non-energy exhaustive businesses & public-sector establishments with high energy consumption. Furthermore, the presence of the major market players such as SGS, Bureau Veritas, and Intertek also support the growth. North America holds a significant share in the TIC services market. The market is driven by the upsurge in food safety audits in the region. Food and Drug Administration Authority (FDA) of U.S. had introduced the Food Safety Modernization Act to transform the country’s food safety system with its primary focus on preventing foodborne illnesses. Under this act, the government has set different standards for a variety of food products. This has resulted in a rise in the number of tests, inspections and certification activities in the country. The TIC services market is highly fragmented due to the presence of large number of service providers in the space. The top 15 players account for more than 25% of the total share in the global market. The key players are leveraging on mergers and acquisition activities to attain the inorganic growth and gain market share. For instance, SGS alone had completed more than 12 transactions in 2017. These players are mainly targeting small deals that indicate the scarcity of the sizeable targets in the fragmented market and high price of large-scale deals that offer less scope for value creation. The major players in the TIC service market are SGS SA, Bureau Veritas, Intertek, DEKRA, Eurofins, TUV SUD, DNV GL, TUV Rheinland, Applus, SYNLAB, TUV Nord, LR, ALS, SOCOTEC, Corelab, Kiwa Group, RINA, Apave, and UL. The TIC services safeguard the maintenance of well-being, safety & quality requirements of the customer products and services. The companies operating in TIC market provide verification, inspection, and testing & certification services to help their clients increase productivity & to assist local manufacturers to adhere to the international standards. The testing activities mainly focus on measuring the properties and the performance of the products and services. Inspection comprises of measuring, examining, testing and gauging the multiple product characteristics and comparing the results with specified requirements to determine whether each of the product characteristics is as per the required standards. Whereas, the certification service segment monitors whether the company and its products have followed all the regulatory norms and standards set by the region in which the product is being sold.